Are you familiar with scaled agile frameworks (like LeSS)? Then you most likely also know the terms product bazaar, review bazaar, application bazaar, showcase, or science fair. As soon as we are working in an environment where not only one but several Scrum teams are working on something together, a simple sprint review per team is not sufficient anymore. We require a new format which enables us to bring the work of all teams involved together. Since we are aware that it’s not a product review’s sole purpose to show potentially shippable increments we try to actively gather feedback, exchange opinions with stakeholders and jointly rethink the further product development. In order to satisfy our customers and continuously deliver value, we frequently need to get their feedback. How can we scale the collecting of feedback, the exchange with stakeholders and customers from one team to many teams without losing the developer’s motivation and without investing a great amount of time? 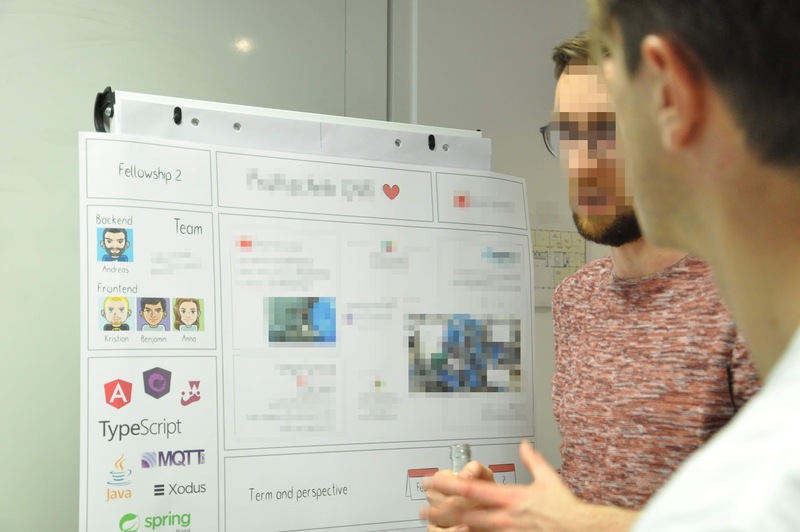 Colleagues from one of our scaled Scrum projects in the automotive industry have successfully tried out the concept of a product bazaar in order to align and communicate with many teams and stakeholders involved in one product. Bazaar - What is that? 2) Communication: The most efficient and effective method of conveying information to and within a development team is face-to-face conversation. Therefore: If possible, rather invest the money in a productive onsite bazaar instead of trying to make a video or a remote conference. It just won’t work as good as the face-to-face communication and feedback. Of course, we know it’s not always possible. 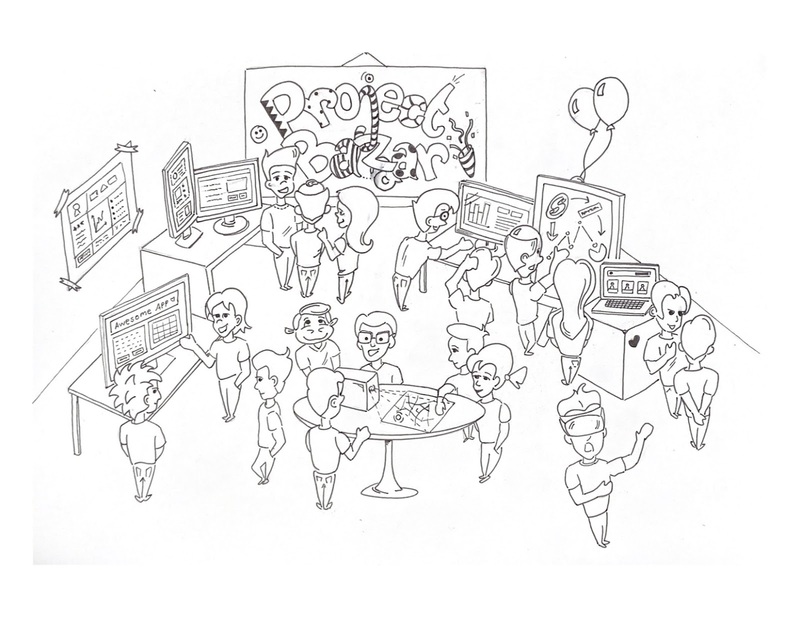 At Comsysto Reply, we also constantly try to find ways to integrate our remote colleagues. In Part II you can find some experiments and tips for the remote version. 3) Interaction: Last but not least: All relevant persons and roles should be there (just like at any other sprint product review). Remember: Individuals and Interactions over processes and tools. Don’t try to over-engineer your bazaar but instead get all relevant persons (developers, business and customers) there so that they can talk to each other. How long are the team’s sprint cycles? Which iteration length makes most sense in the product’s environment? How often are new features being built? How many people will be at the Bazaar? How much travel time do you need to take into account for all participants? Which time intervals are logistically and organisationally doable? You will find more details regarding the organization and implementation of a bazaar mentioned below. In case you don’t know it yet, Comsysto Reply is not a product company. You would probably classify us as consultants (even if we don’t always like that term) in the agile software development sector. However, we are working on many different projects and in various teams. Therefore we benefit a lot from transparency and shared knowledge. To be precise, it is not easy for an employee to get an overview of all our projects and respective teams. It is even harder to get down to details like the technologies, team setup, project duration, team processes and product vision. Since we are an agile company with an emphasis on transparency and self-organization as well as personal responsibility, the described knowledge and exchange above are important for us. To be honest, it is not only important for us but a precondition for our agile values and principles to stay alive. We (the employees) are challenged to look for a suitable new project within Comsysto Reply where we could join and support colleagues wherever help is needed. In addition, a few of the Comsysto Reply colleagues have already participated at several product bazaars as part of their projects for one of our automotive customers. They are working on a product where more than ten teams are involved and we constantly put a lot of effort into the alignment and communication between all teams involved and their respective stakeholders. Thus, a product bazaar seemed to be a good idea in that environment and it was proven to be very valuable. As a result of these thoughts we concluded quickly that a bazaar can help us a lot. In our case (a consulting company), the bazaar is not a typical product bazaar but rather a project bazaar. Instead of presenting different product features, we are presenting different projects we are working on. 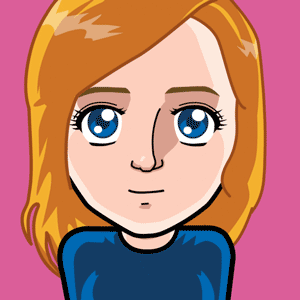 And feedback regarding features and users is replaced by feedback regarding the project and team setup. 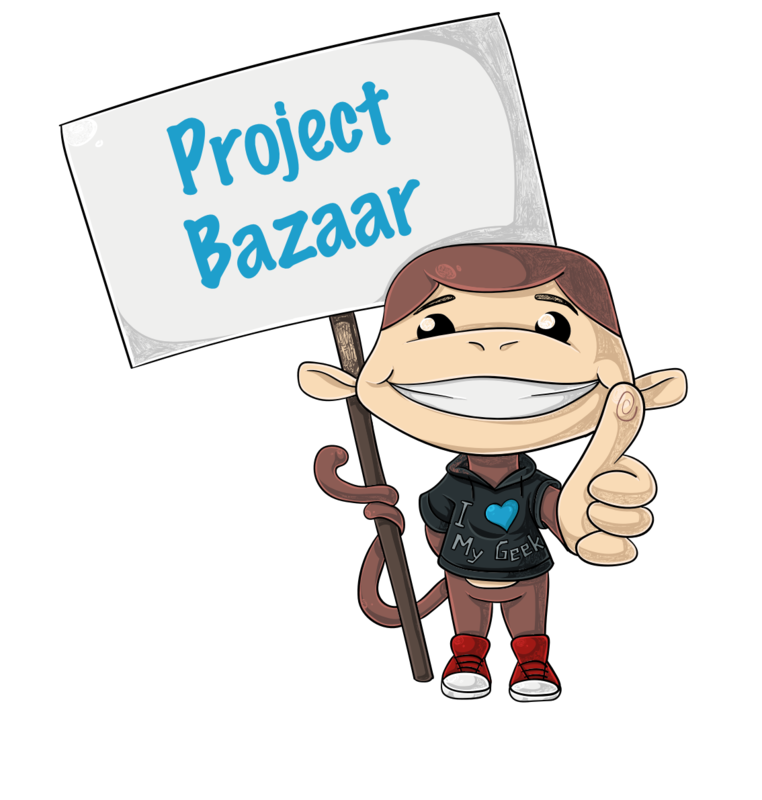 The project bazaar: For project organizations like consultancies where teams work in different projects but still need feedback, transparency and knowledge transfers across the projects. 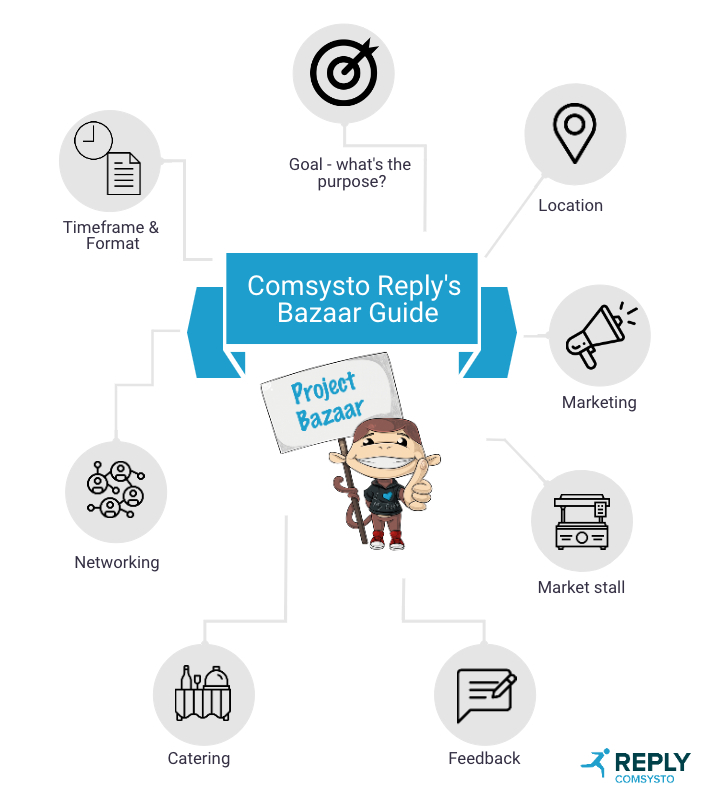 In this blog post, we mainly talk about our experiences with the first Comsysto project bazaar. We try to point out some slight differences to an application (or product) bazaar, but the main idea remains the same. 4. Bazaar experiment at Comsysto Reply - How to? We divided the development of our project bazaar in several phases as well as categories and worked in short cycles since we didn’t know yet how exactly it would turn out. What’s the purpose of your bazaar and what do you want to achieve? 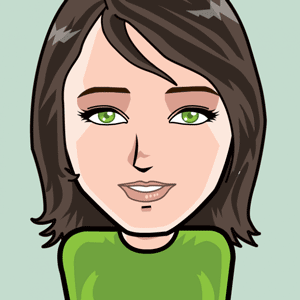 - The answer to this question will determine how your bazaar will look like in the end. In our case, that was quite clear, we wanted to achieve exactly what is described above in the article: Provide our teams a chance to get an overview of all our projects, talk to other teams about their projects, give feedback and identify new potentials. Highly motivated, an employee explains what his project is about to his colleagues. Try to find organizational categories to split the work and find a group of people who is motivated to help. Don’t go into detail yet with planning. If you would like to see more generic information about the different categories, you can download our overview here. Further description of our Comsysto bazaar will follow in Iteration 4. Are your colleagues and teams (and in case of a product bazaar also: stakeholders, customers, users, business owners) really in need of something, do they miss something and does this correlate with your defined purpose above? How many colleagues / teams would like to participate with a market stall? How many colleagues would like to visit the bazaar? In case of a product bazaar: How many stakeholders, customers, users, business owners would like to visit the bazaar? 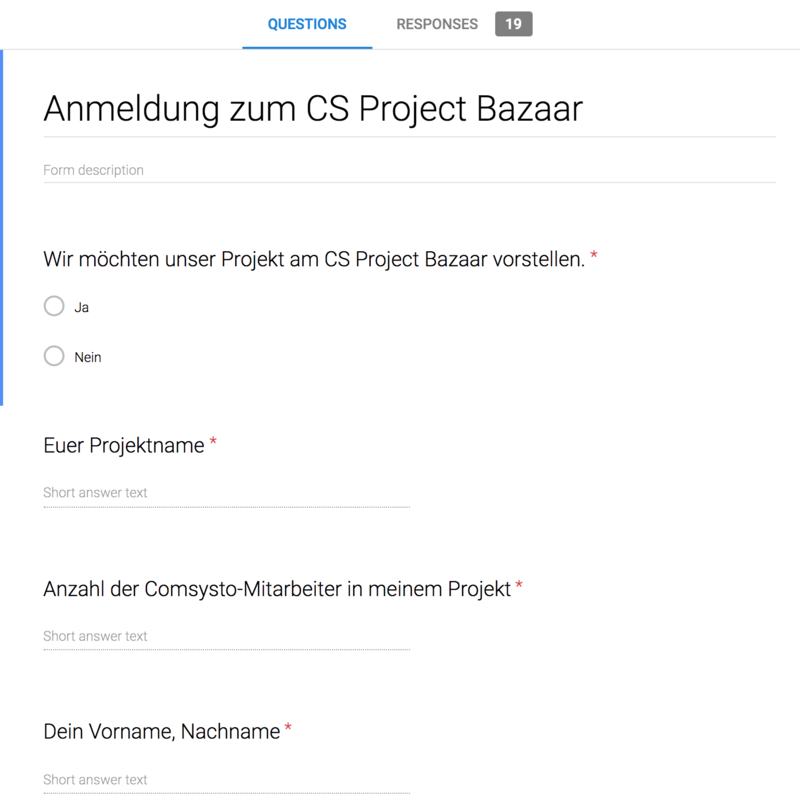 As a learning of our first Comsysto Reply project bazaar, we can tell you that you might want to proceed with the validation of your hypotheses even before you think about the topics we mentioned in Iteration 2. Depending on your context, you might want to switch Iteration 2 and 3 from this blog post. You can validate your hypotheses simply by talking to people and by doing surveys. In our case, we created a short survey that we distributed with our first round of communication (see marketing). In this survey, our colleagues were asked if they would like to participate, if they would like to have a booth with their team and how many team members they are. Within only a few days, we already had more than 10 Comsysto teams signed up for the bazaar and we knew that we were on the right track. This was the sign for us to proceed with the more detailed planning and organization phase. Does it stop after Iteration 3? Well - that depends. How did the validation of your hypotheses go? Did you find the right problem? Did you find the right people to talk about your assumed problem? Are you intrigued to plan your own bazaar journey, but don’t really know where to start? Talk to us - we are passionate about this topic and would love to help out.